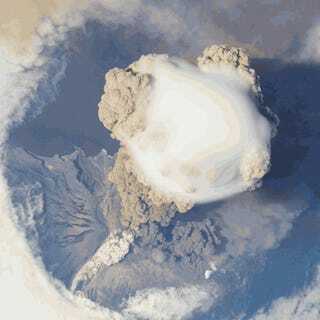 On June 12, 2009, Russia's Sarychev Volcano erupted in spectacular fashion, issuing plumes of ash skyward in a phenomenal display of geophysical force. It was the first time Sarychev had erupted in over twenty years – and it happened, rather serendipitously, just as the International Space Station was flying overhead. There's a lot going on in this brief sequence. The billowing plume casts a black shadow on the lands below. Dense, dark ash – most likely a pyroclastic flow – can be seen racing down the slopes of Sarychev's summit. The smooth, milky cloud situated atop the largest ash-plume, uncannily white given the circumstances, is called a "pileus cloud," and is thought to form transiently as the air above the ash column rises and cools, condensing the air above it into a lenticular cap of moisture. Already it appears the underlying plume is beginning to force its way through the cap from below. And yet the most arresting thing about this footage remains, in my opinion, how incredibly strange and removed it looks. Like a tilt-shift photograph, the subject appears miniaturized in a way that almost makes it seem unreal. And no wonder. From space, even a volcanic eruption can seem small. The footage you see here was photographed by astronauts aboard the ISS and later assembled into the "oblique animation" you see here. Originally written up over at NASA's Earth Observatory, NASA Goddard recently uploaded the animation to their Instagram, where it first came to our attention.